Create ringtones on Audiko.net! 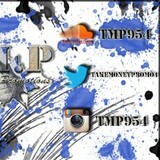 We offer you to download a free TMP954 ringtones for your iPhone or mobile. Suit yourself your favorite segment from your favorite piece of art - Young Scooter Ft Young Dolph - Real, Kodak Black Ft XXXTenTacion - Roll In Peace, French Montana Ft Gucci Mane & Kodak Black - LockJaw, or any other track. It’s possible to have your tone both in the MP3 and m4a formats, compatible with both mobile phones and iPhones. Just select a track, and choose free TMP954 ringtones download option.